Miami Local Mattress Cleaner 305-631-5757 Steam Clean Your Mattress. A customer called us to see if we could save her mattress from a huge pet accident from her dog. With out her trying to remove the stain herself, she called and booked an appointment with us to treat the urine stain and get the mattress clean professionally. See how the mattress was when we arrived on the in the picture below. As you can see in the picture there are several urine stains throughout the mattress, and one huge stain which did not look good at all. We started by treating all urine stains with our specialized urine stain removal agents, and let it sit for about 15 minutes. Then we extracted the urine stains with hot water to remove all the stains from the mattress. After extracting and removing the stains we proceeded with the cleaning and odor treatment. 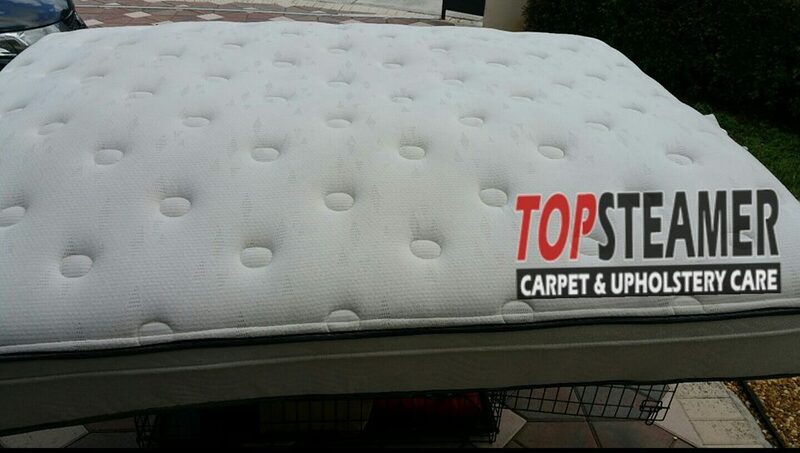 After the deep cleaning we were able to save the mattress for our customer. You can see the after cleaning picture below, you won’t believe the difference.